“To Be Takei” is a conventional documentary, but by no means a bad one. The requisite talking heads footage and media clips are assembled into a good narrative structure by Kroot and editor Bill Weber. The 94-minute running time moves briskly, and some of the details presented have an unexpected emotional heft. 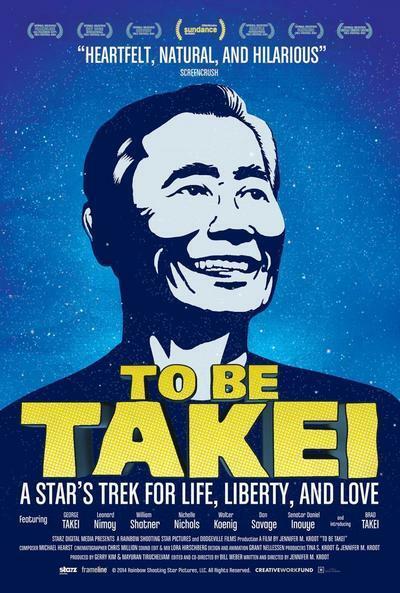 For those who only know Takei as Sulu in the original Star Trek TV series and its movies, “To Be Takei” offers some startling details about the actor and activist. “He’s a nervous wreck, and he knows it,” says George. “I asked him why he’s with me when I make him so…nervous,” he continues with a laugh before pointing out how Brad’s organizational skills are an invaluable contribution to their business relationship. Footage of Brad in action, competently handling the minutiae of his celebrity husband’s event-filled days, compliment the more emotional, self-described “temper tantrums” we occasionally see onscreen. At autograph signing events and Star Trek conventions, Brad keeps the line moving, funneling details to George before he speaks to the next fan. Though "Star Trek" plays a large role in “To Be Takei,” It’s not the film’s main focus. While there are interviews with Walter “Chekhov” Koenig and a silver-haired Nichelle “Uhura” Nichols, this is less Trek-oriented than one might expect, though it is used as a jumping-off point for several other topics. Trek’s creator, Gene Roddenberry, hired Nichols and Takei to show a diversity onscreen that did not exist in 1966. Takei’s Sulu, who would eventually become captain of his own ship in “Star Trek VI: The Undiscovered Country,” made an impression on viewers, especially those of Asian descent. Actors like John Cho and Lea Salonga explain how seeing an Asian person onscreen in a positive role influenced them. “To Be Takei” doesn’t shy away from contradictions in Takei’s long life and career. The film highlights Sulu, but it doesn’t ignore the more stereotypical characters George Takei was advised to play by his agents after NBC cancelled the original "Star Trek" series. There are cringe-inducing clips of Jerry Lewis movies and TV cop shows, and Takei appears onscreen to apologize for them. There is also audio of Takei’s first appearance on Howard Stern’s show, where the now very active gay rights activist denies his homosexuality. Stating that he did it for career purposes, Takei connects his stereotypical acting roles with his days of being publicly closeted. Rejecting both allowed him to present a totally positive and accurate representation of himself in every venue in which he appeared. “To Be Takei” also powerfully covers Takei’s childhood spent in a Japanese-American internment camp during World War II. Over footage of the camps, George narrates how his and other middle-class Asian immigrant families lost their farms and businesses when FDR issued Executive Order 9066. Takei speaks of wounding his father deeply by blaming him for not standing up to the government. Takei channels his pain and regret into his current role in “Allegiance,” a musical/memory play about the camps and the aftereffects they had on future generations. The day I screened this film, my RogerEbert.com colleague and friend Scott Jordan Harris—an activist himself—penned a piece on a meme George Takei posted to his followers. The meme presented misinformation about the abilities of people who used wheelchairs in an attempt to score laughs. Harris pointed out that the person in the picture didn’t deserve mockery because, for starters, some wheelchair-bound people can stand and/or walk short distances. After an initial “it’s only a joke”-style response, Takei issued a second one apologizing for the meme, citing that he was unaware that not everyone in a wheelchair lacked mobility. He also spoke to the followers who vehemently claimed he didn’t have to apologize to anyone, citing that, as an adult, he had the final say on his acts of contrition. What It Means "To Be Takei"